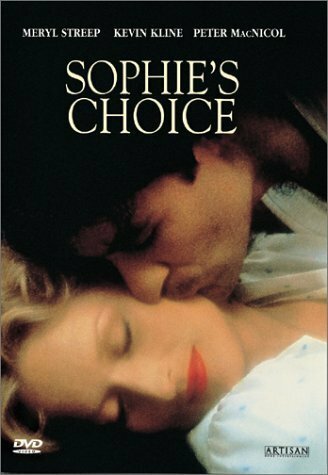 Today's Sunday Slacker video is a follow-up to yesterday's Saturday Matinee: Sophie's Choice. There are two actually; a couple of ten minute clips extracted from Death Dreams of Mourning: The Making of Sophie's Choice, a behind the scenes documentary made for the release of Sophie's Choice on VHS in 2001. The clips feature author William Styron discussing the writing of the book inspired by a Polish woman he met at a boarding house in Brooklyn in the summer of 1947. Like Sophie she had survived Auschwitz, her story and her memory haunted him until he finally wrote the book in the 1970's. Meryl Streep talks about the difficulty of making the film, of her first understanding of the horror of humanity. I think that people who go through a certain kind of horror become numb and have no feeling sometimes. And I think Nathan made her feel alive in the most horrific moments of their relationship. I think that whatever kept Sophie alive across that journey to get to Brooklyn, across Europe and over, there was hope in her. I just remember the end of my childhood when I was ten and my mother dropped me off to the library. I opened a book and there were photographs of the "Lebensborn" program where children were taken in transports, supposedly to be adopted. And one of these transports just ran out of gas and the drivers walked away and left these children who died... the piled up bodies on the truck. I will never ever forget that image. It forms the basis of my emotional understanding of unimaginable horror". I can't locate the 53 minute documentary in its entirety so far now these clips will have to do. Of course there are spoilers so do watch at your own risk. I've followed the clips with the trailer.